Brave victim of Sunday's shooting attack hailed as hero by Jerusalem police commander, mayor hours after he was attacked. 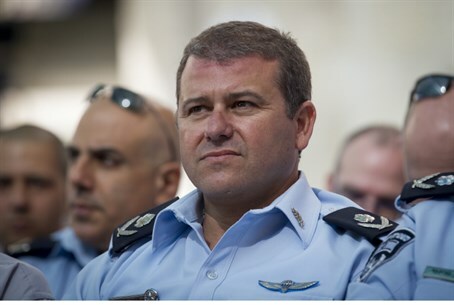 "The rapid response, despite severe injury, resulted in the immediate termination of the terror attack and prevented further harm to innocent people," Jerusalem District Commander Moshe Edri said at the scene. "The [policeman] acted professionally to neutralize the terrorist, and is worthy of every praise and blessing - and I wish a quick and complete recovery for this courageous soldier." Edri added that the Jerusalem Police District is prepared for every possible scenario. "We deployed a large police detail on the ground to maintain the security of the residents, constantly assess the situation and adjust our preparedness accordingly." "Any incident where police officers or civilians are injured should end in the assassination of the terrorist," he added. Jerusalem Mayor Nir Barkat also commended the officer. "I want to commend the action of a border policeman, who kept his composure despite his injury and shot and neutralized the terrorist and thus saved lives and prevented further injuries," Barkat said. "We all pray for his recovery." "We must persist and continue our daily lives," he continued. "I call upon all the citizens of Israel continue to visit Jerusalem and strengthen it. This is the message that terrorism is trying to make - to disrupt our lives."